West led a spade to his partner's king, which held the trick. East looked at the two tricks in his hand and the menacing club suit in dummy, and thought "the only way we're going to set this contract is if partner has the ace of diamonds. Then he can give me a ruff for our fourth trick." So East led his singleton diamond. West won the ace, thought for a while, and decided his partner wanted a spade led through the queen. So he tabled the spade jack, trying to smother declarer's supposed ten. Declarer ruffed, drew trumps, and claimed +420. East berated his partner for never giving him ruffs. West led a spade to his partner's king, which held the trick. East looked at the two tricks in his hand and the menacing club suit in dummy, and thought "the only way we're going to set this contract is if partner has the ace of diamonds. Then hopefully he'll figure out to duck the first one so when I'm in with my trump ace I can lead another diamond and he can give me a ruff for our fourth trick." So East led his doubleton diamond. West, having been yelled at just a few hands prior, jumped up with the ace and led another one back. Declarer scooped up the tricks, drew trumps, and claimed +420. East yelled at West for never knowing what the hell was going on at the table. I think East was the culprit in both of these hands. First of all, his behavior was horrible. If you can't keep from yelling at or berating partner when he makes a mistake, you need to take up a new game. All players make mistakes. You do, I do, Jeff Meckstroth does. If you can't live with you or your partner making mistakes, bridge is not the game for you. Incidentally, I heard a local player the other day analyzing a two-session event he'd played the day before. "I made three errors yesterday," he said. This person is fooling himself. Even the top experts make several errors per session. I asked my friend and top Canadian expert Cam Doner once, "What's the biggest number of hands in a row you've gone without making a mistake?" His answer: "One." Now there's a man who's honest with himself. Every player makes mistakes, but it's the good players that work hard to keep their partners from making mistakes. 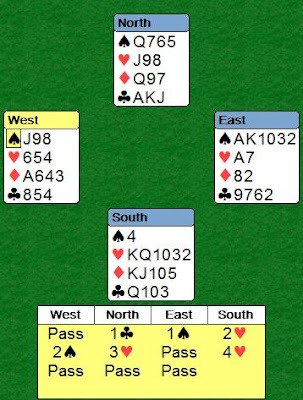 On the first board, East should have won the first trick with the ace of spades. "Knowing" that declarer had the king, West would see no future in the spade suit and return the diamond for East to ruff. On the second board, when East wins with the king and puts a diamond back again, West should realize that now that he has a partner who's trying to get the right information to him, the defense isn't a blind guess any more. He needs to weigh the possibility that East has led a doubleton diamond [it can't be singleton since the king won the first trick] against the possibility that he led from three or more diamonds and needed a spade led through. My reasoning would be this: It's far more likely on the auction that East is 5=2 in spades and diamonds than that he's 4=3 or 4=4, because I know he has at most two hearts. If he had a good hand with 4=2=3=4 or 4=2=4=3 or 4=1=4=4, he'd probably double 1H rather than overcall 1S. Since he did overcall 1S, I'll play him to have five spades and two diamonds. I'll duck this one, hope partner has a trump trick so he can lead a second diamond to get his ruff! See how much easier the defense is to figure out when West knows that East's diamond isn't a singleton? were you the director when these boards were played? I think this is an Aesop story as opposed to a real one, Ellis. And in either case, west has a real issue on the lie. Playing with me, Mac, you have the same problem on both hands, although I think a stiff diamond is most likely - hand #1 - given our overcalling agreements.